In June 2013, heavy rainfall triggered catastrophic flooding in southern Alberta that has been characterized as some of the worst in the province’s history. Areas along the Bow, Elbow, Highwood, Red Deer, Sheep, Little Bow and South Saskatchewan Rivers, and their tributaries, were affected. Estimates of property damage from the flood make it one of the most costly in Canadian history. Personal property, however, was not the only casualty. 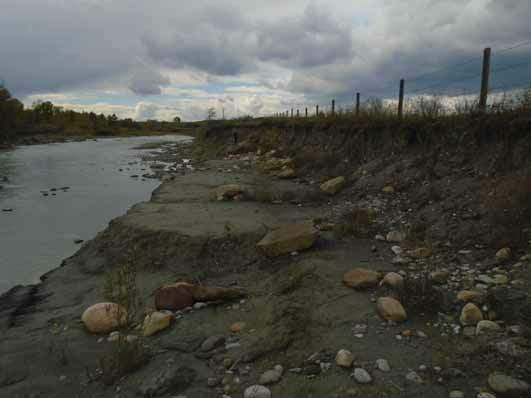 The torrents of water accelerated natural erosional and depositional processes, resulting in significant alteration to many of southern Alberta’s river systems. Debris-flow fan on the Highwood River. 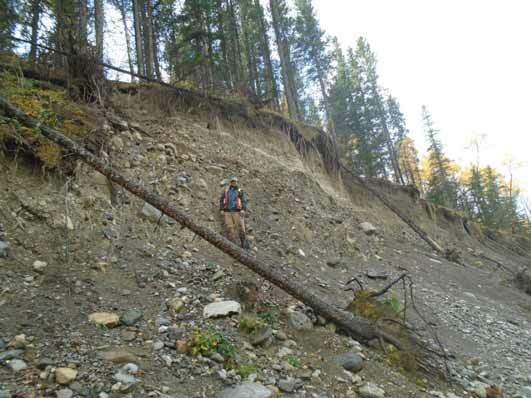 Erosional exposure on the Sheep River, caused by the June 2013 flood. It’s hard to overstate the profound impact of firearms in Alberta’s history. The earliest guns delivered food, protection, and intimidation. Technological improvements from European contact to the 1900s led to significant changes in the ways that guns were used across the province. This blog briefly explores the evolution of firearms in Alberta and the archaeological record of it. Firearms were introduced to Canada in the 1500s but didn’t spread to Alberta until much later. Their first appearance in the province was likely through raiding or trading in the southern U.S. by Plains First Nations. Early gun models, like flared-mouth blunderbusses, were designed for close encounters on battle fields but proved ineffective on the prairies. It wasn’t until the advent of portable flintlock muskets that guns spread like wildfire across the West. An 1805 Barnett flintlock trade musket that came to be one the most popular Northwest Trade guns. Over 20 000 guns were sold out of Canada’s major fur trade depot at York Factory from 1600 to the late 1700s. Figure by Todd Kristensen and Julie Martindale. April 10 to 16, 2016 is National Volunteer Week in Canada. Well over 12.7 million Canadians have generously donated their time and energy to important causes. Volunteers help our communities grow strong and resilient. Even the smallest effort has the ability to transform, leaving profound and lasting effects in local communities. The work of volunteers affects virtually every aspect of our society and the heritage field is no exception. This week is the perfect time to reflect on the importance of volunteer work involved in the preservation of heritage. Over the years, the Archaeological Survey section of Alberta Culture and Tourism has developed a strong working relationship with the staff of the Parks Division of Alberta Environment and Parks. Both ministries regularly collaborate on joint efforts to preserve Alberta’s natural and cultural heritage for future generations. An important component of our preservation partnership is sharing heritage information with Parks volunteers. The Archaeological Survey participates in these programs to help Parks provide support, increase communication and offer new learning experiences for both staff and volunteers.